"Let history bear witness that no American ever had to bow to a tyrant!" 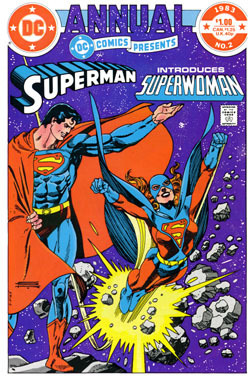 Superwoman has appeared in: DC Comics Presents Annual #2 and DC Comics Presents Annual #4. She also had a small cameo in Alan Moore's imaginary story, "Whatever Happened to the Man of Tomorrow?". If you know of any other appearances, please contact us. Thank you! JUST READ THE STORY FIRST, PUL-LEEAAZZZE! Well, if you haven't already read the story and you're still with me you're probably one of those people who hates surprises and there's no reasoning with you, so come along. Julie, I hope you recognize one of the new characters in this story. You've read the name "Kristin Wells" before. She was the nineteen- or twenty-year-old graduate student at Columbia University in the twenty-ninth century who was a major character in my novel, Superman! Miracle Monday. You said you liked the book, so I thought you might like seeing one of its pivotal characters again. In the book, Kristin is a history student who is so fascinated with one of the unsolved mysteries of Superman's twentieth century that she makes a journey into the past - on a foundation grant, of course, not a student's budget - and finds out the secret of the interplanetary holiday, Miracle Monday. Not only does she discover the joyful holiday's secret origin, but she figures prominently into that origin herself. I continued that theme in Kristin's life with this story by making her come back - as an eminent, seasoned professor now, not a callow student - in order to learn the yet undiscovered secret identity of the mysterious "Superwoman" who appeared in Metropolis in 1983. In this story she discovered, to her own mixed emotions, that Superwoman was none other than a history professor from the twenty-eighth century named Kristin Wells. You'll remember, also, that at the novel's end, the memory of her presence in the twentieth century was wiped from the minds of everyone on Earth except for Superman. So Kristin and Superman are old friends, even though in this story she's a "new girl" in town. Kristin is not actually as new as she seems. In a previous incarnation, she was a character named Joanne Jaime. That was in one of the last Superman stories I did for you years ago - in a previous incarnation myself - called "The Miracle of Thirsty Thursday." Joanne was a history student from the future who is dismayed when she comes to the past - our time, that is - to investigate a historic event and finds that all the people she meets are other historians doing research along with her. She finds no local color, only observers like herself to pollute the broth. I refined Joanne into Kristin for the novel, and I've tried to make her consistent and engaging for this story. You said you wanted a different sort of new character for your Superwoman, Julie, so here she is. I hope you like her, because I think I'm in love with her. As for King Kosmos, he's completely new with this story, and he's a baddie all right; a dictator who was overthrown from the rule of a devastated Earth-like world who comes to our planet looking for a place to rule. He has the ability, like that of Superwoman, to negate dimensional protocols and travel among various times or parallel universes at will. Superman can do that sort of thing also, of course, but it's about the most difficult thing he knows how to do. For Kosmos it's as easy as setting a course and pressing a button. If you say so, he'll be back as well. I wanted to mention one more interesting thing about my novel, Miracle Monday, if you don't mind. This is something I never really made much of or told anyone about, but for me, at least, Miracle Monday is a real holiday. In the book it's the third Monday of every May. On that day, according to the book, resort owners on the glaciers of Uranus raise ski-lift tickets for the influx of tourists. Teamsters driving slow-moving cargo transports to Earth from mining operations in the asteroid belt get drunk and silly like sailors crossing the Equator for the first time. In honor of Superman's chosen profession, even journalists can spend the holiday with their families. There are laughter, reflection, public celebration with barbecues and holographic light shows all over the solar system, merriments of all sorts. It's a big holiday. As it happens, here in the real world, I received my first copy of Superman: Miracle Monday in the mail from my editor at Warner Books on May 18, the third Monday in the month of May, 1981. It was a special day, totally coincidental, and I've never really told anyone that before. Considering what Superman did in the book on that day, it was a holiday worth celebrating for a long time, so along with my birthday, Einstein's birthday and the first day of summer, Miracle Monday is a day that I will probably continue to set apart.